What Kind of Mayor Was Bernie Sanders? In his eight years as mayor of Burlington, Vermont, Bernie Sanders revitalized the economy and solidified support for progressive municipal policies. John Davis remembers a meeting in 1986 when Bernie Sanders, then the mayor of Burlington, Vermont, confronted the owners of the city’s largest affordable-housing complex. The federal program that had subsidized the Northgate Apartments for 20 years had a loophole that allowed the landlords to convert the buildings into market rentals or luxury condos. “Bernie pounded his fist on the conference table in his office and told the owners, ‘Over my dead body are you going to displace 336 working families. You are not going to convert Northgate into luxury housing,’” recalled Davis, who was Sanders’s key housing aide. Under Sanders’s leadership, the city adopted a number of laws to stifle the owners’ plans. One ordinance required apartment owners to give residents two years’ notice before a condo conversion. Others gave residents a pre-emptive right to buy the units and prohibited landlords from bulldozing buildings unless they replaced them with the same number of affordable units. (These measures lowered the selling price of the property.) Sanders then worked with the state government and Senator Patrick Leahy to get the $12 million needed to purchase and rehabilitate the buildings. The city allocated funds to help the tenants hire an organizer, form the Northgate Residents Association, and start the process of converting the complex to resident ownership. Today, Northgate Apartments is owned by the tenants and has long-term restrictions to keep the buildings affordable for working families. The battle over Northgate Apartments illustrates Sanders’s general approach to governing. In addressing this and many other issues, he encouraged grassroots organizing, adopted local laws to protect the vulnerable, challenged the city’s business power brokers, and worked collaboratively with other politicians to create a more livable city. 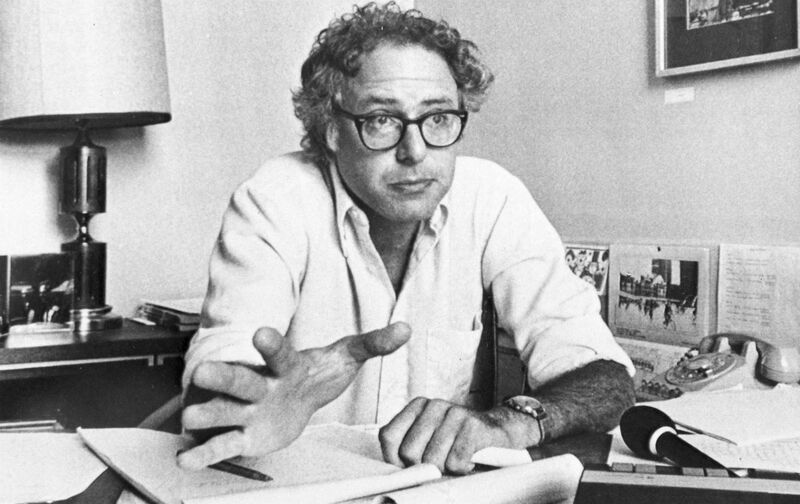 Now that Sanders is running for president, the eight years he spent as Burlington’s chief executive (1981–89) will be under close scrutiny. Although President Obama recently joked at the White House Correspondents’ Association dinner that Sanders is a “pot-smoking socialist,” he was actually a hardworking, pragmatic, effective mayor who helped transform Vermont’s largest city (population: 38,000) into a thriving town. Thanks to the enduring influence of the progressive climate that Sanders and his allies helped to create in Burlington, the city’s largest housing development is now resident-owned, its largest supermarket is a consumer-owned cooperative, one of its largest private employers is worker-owned, and most of its people-oriented waterfront is publicly owned. Its publicly owned utility, the Burlington Electric Department, recently announced that Burlington is the first American city of any decent size to run entirely on renewable electricity. Sanders grew up in Brooklyn and attended the University of Chicago, where he was active in the civil-rights movement. After a short stint living on an Israeli kibbutz, in 1964 he moved to Vermont, where he worked as a carpenter, filmmaker, writer, and researcher, and got involved in radical politics. In the 1970s, after joining the antiwar Liberty Union Party, Sanders ran for several statewide offices, including governor, US Senate, and the US House (Vermont has only one seat). He never garnered more than 4 percent of the vote, but he did better in Burlington than in Vermont’s rural areas, which gave him hope that he had a shot at winning office in the local government. In 1981, Sanders ran for mayor of Burlington as an Independent and defeated six-term Democratic Party incumbent Gordon Paquette by ten votes in a four-way contest. Voters re-elected Sanders three times by increasingly wider margins: 52 percent in 1983, 55 percent in 1985, and 56 percent in 1987. Burlington was no hippie counterculture enclave. Although the city attracted many young, educated people because of its natural beauty and the presence of the University of Vermont, it has always had a large working-class population (many of them from French Canadian stock) who, until Sanders came on the scene, tended to vote for moderate Democrats and Republicans. Each time he ran for mayor, Sanders attracted increasing support from the city’s blue-collar precincts. After he was re-elected in 1983, and voters swept in a more progressive City Council, Sanders gained a stronger foothold in City Hall. With the support of local Republicans and business leaders, he created the Community and Economic Development Office (CEDO) to carry out his vision for more affordable housing, more locally owned small businesses, greater community engagement in planning, and job development. Thanks to Sanders, the Burlington waterfront now has a community boathouse and other facilities for small boats. There’s also a sailing center and science center, a fishing pier, an eight-mile bike path, acres of parkland, and public beaches. The commercial development is modest and small-scale. On May 26, Sanders kicked off his presidential campaign with a rally at Waterfront Park. Most of Burlington’s business leaders initially distrusted Sanders. They didn’t know what a socialist would do once he held the reins of power. But even many of Sanders’s early opponents came to respect and even admire his willingness to listen to their views and his efforts to adopt progressive municipal policies. Pomerleau was then—and remains today, at 97—one of Burlington’s richest residents. A longtime Republican, he made his money developing supermarkets, hotels, and shopping centers, and he owns much of Burlington’s commercial real estate. For decades, he has wielded considerable political influence, served as chair of the city’s police commission, and been its most generous philanthropist. “When [Sanders] first ran for mayor, he was running against guys like me,” Pomerleau recalled in a recent interview. Pomerleau, who voted against Sanders in 1981, knocked on his door the day after that election. “I said, ‘You’re the mayor, but it’s still my town,’” he recalled. Pomerleau wasn’t happy when Sanders opposed his waterfront development plan, but he gradually got to know the mayor and came to admire his pragmatism, his bulldog tenacity to get things done, and his support for the local police. Pomerleau voted for Sanders in his three successful bids for re-election. And Sanders frequently called Pomerleau to ask his advice. They stayed in close contact, even after Sanders was elected to Congress. Pomerleau expressed his pleasure that for the past 35 years Sanders has never missed one of his annual Christmas parties for underprivileged children. He also praised Sanders for being a stalwart supporter of America’s military veterans. After Sanders’s re-election victory in 1983, business groups concluded they could not defeat him and thus had to work with him. But many businesspeople also saw that Sanders shared their interest in “development”—what he saw as “good development”—while opposing projects that would hurt middle- and working-class neighborhoods or victimize low-wage workers. The Sanders administration provided new firms with seed funding, offered technical assistance, helped businesses form trade associations (including the South End Arts and Business Association and the Vermont Convention Bureau), focused attention on helping women become entrepreneurs, funded training programs to give women access to nontraditional jobs, and lobbied the state government to promote business growth. When Sanders took office, Burlington had no supermarket in the downtown area. The major grocery chains told city officials that they would invest in a new store only if they could build a mega-market that residents believed was too large. Instead, the Sanders administration put its hopes in the local Onion River Cooperative. With 2,000 members in its former location, some thought it was a risky venture. It turned out to be a good investment, and under Sanders’s successor it became City Market, a thriving enterprise with more than 9,000 members. Under Sanders, Burlington became a magnet for attracting and incubating locally owned businesses, many of which expanded into large enterprises. Burton, the nation’s largest snowboard company, has its headquarters (as well as a snowboard museum) in Burlington. The city assisted Seventh Generation, a green cleaning-products firm, when it started in 1988. Today, with its downtown waterfront headquarters in a LEED-certified building and over $300 million in annual sales, it is one of Burlington’s largest employers. With the city’s help, Gardeners Supply Company, which sells environmentally friendly gardening products, moved to Burlington in 1983. Four years later, its founder, Will Raap, began the process of selling the firm to its workers. It now has over 250 employee-owners. As he was transitioning Gardeners Supply to employee ownership, Raap also began organizing volunteers to clean up a largely derelict floodplain north of the store. Eventually CEDO, Sanders’s development agency, helped arrange the purchase of the area and provided the capital for irrigation systems, farm vehicles, and washing stations for vegetables. By the end of the 1990s, it was home to a dozen urban farms, annually producing over 500,000 pounds of food for local homes and stores. Today it generates over 10 percent of the food sold in Burlington. Burlington’s strong economy and population growth put pressure on the city’s housing supply, threatening to displace low- and middle-income families. Under Sanders, the city adopted policies to create permanently affordable housing. The city channeled a large portion of its federal block grant funds to nonprofits committed to that goal, and cultivated a constituency of these small development organizations. The first key move was support for the Burlington Community Land Trust with an initial $200,000 grant. Now named the Champlain Housing Trust, the nonprofit has over $290 million in assets; manages a portfolio of 2,800 price-controlled houses, condos, co-ops, and rentals; and owns over 120,000 square feet of commercial space and nonprofit facilities. To provide funding for new housing initiatives, the Sanders-led city created a housing trust fund, capitalized in part by a 1 percent increase in property taxes. A year after Sanders left office, the coalition he built successfully pushed the City Council to enact an inclusionary zoning law. Market-rate residential projects were required to set aside 10–25 percent of the units at rents and prices affordable to families with modest incomes and to keep them affordable for 99 years. The Sanders administration carefully nurtured neighborhood planning assemblies (NPA) in each of the city’s six wards, providing them with modest budgets to deliberate and advise on projects affecting their neighborhoods. The NPAs had a voice over the use of federal Community Development Block Grant funds in their neighborhoods. Today, Burlingtonians credit the NPAs with raising the level of resident participation and discussion in local politics. Sanders jump-started the city’s participatory energies in other ways as well. Early on he established a Youth Office, an Arts Council, and a Women’s Council, whose first major initiative was an ordinance requiring 10 percent of all city-funded construction jobs to be filled by women. Sanders’s track record as mayor was so successful that Burlington voters elected his CEDO director, Peter Clavelle, to succeed him in 1989. (He was voted out in 1993 but re-elected in 1995, and served until 2006.) During his 16 years in the mayor’s office, Clavelle expanded Sanders’s agenda. A Republican held the office from 1993 to 1995, and another independent progressive, Bob Kiss, served from 2006 through 2012. After a controversy erupted over the city-owned Burlington Telecom, Kiss declined to run for re-election. In 2012, for the first time since Sanders’s first campaign in 1981, Burlington elected a Democrat—Miro Weinberger—to serve as mayor. Although more conservative than Sanders, Clavelle, and Kiss, he has been reluctant to reverse their policies because they’ve been so popular. Burlington’s progressives have not only held on to their main policy achievements but, after the most recent election, have gained seats on the City Council and catapulted Progressive Party member Jane Knodell into the presidency of that body. In the 1970s and ’80s, Sanders was one of a handful of mayors—including Paul Soglin of Madison, Wisconsin; Gus Newport of Berkeley, California; Ruth Goldway of Santa Monica, California; Chicago’s Harold Washington; and Boston’s Ray Flynn—who sought to use the levers of local government to adopt enlightened progressive policies. More than in any other city, Burlington’s progressives consolidated those reforms over the long haul. The coalition that coalesced around Sanders in 1981 governed Burlington for all but two of the next 31 years. Burlington is now widely heralded as an environmentally friendly, lively, and livable city with a thriving economy, including one of the lowest jobless rates in the country. Burlingtonians give Sanders credit for steering the city in a new direction that, despite early skepticism, proved to be broadly popular with voters. A growing number of cities—including Seattle, New York, Phoenix, Pittsburgh, Los Angeles, Minneapolis, Newark, and others—are now led by progressive mayors. They are adopting municipal minimum wage laws, requiring developers to build mixed-income housing, strengthening regulations against corporate polluters, and enacting other policies to address the nation’s growing economic inequality and environmental crises. What they can learn from Sanders is that good ideas are not sufficient. Creating more livable cities requires nurturing a core of activist organizations that can build long-term support for progressive municipal policies. Pierre ClavelPierre Clavel is professor emeritus of city and regional planning at Cornell University and author of The Progressive City and Activists in City Hall.